It’s not uncommon for me to ask a new patient at our Charlotte dental office, “Do you have any issues with acid reflux/heartburn?” It’s also not uncommon for that new patient to ask in response, “Why do you ask?” The answer is simple and easy to understand once you think about it, but most people never stop to think about it, so here’s why I ask. Take a look at the graph below (click on it to see a larger version), provided courtesy of GC America, maker of MI Paste & MI Paste Plus for remineralizing teeth, and look how far down the list stomach acid is. Right above battery acid! Now…….just imagine what happens if a little bit of that stomach acid gets back into your mouth. Hmmmmm???? After all, everyone knows that sodas are bad for your teeth, but stomach acid is even worse. 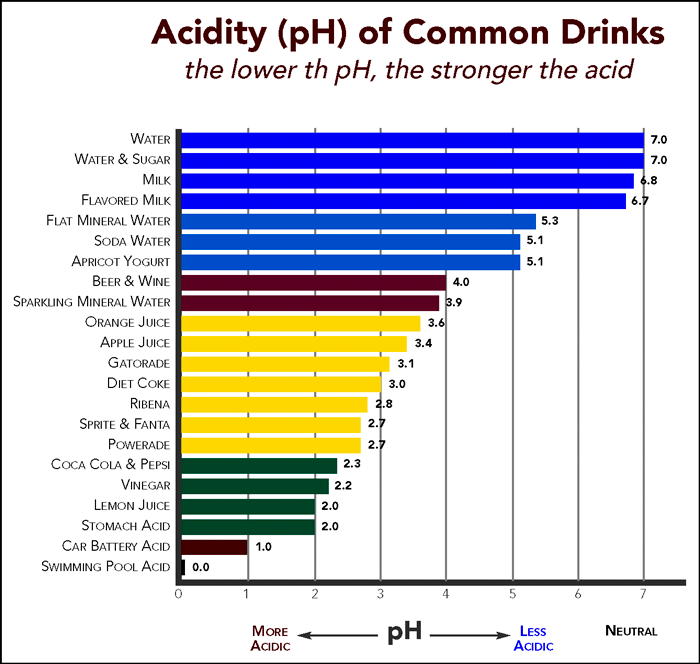 Whether it is from heartburn, regular vomiting, bulimia, it doesn’t matter, the acidity will literally eat away the enamel of your teeth by “sucking” the minerals out. I can’t begin to count the number of women who have told me, “I had perfect teeth until after my second baby!” After viewing the chart, that statement actually starts to make sense, doesn’t it? After all, babies put a lot of pressure on the stomach, hormones create morning sickness, and what you end up with is an extended period of time when the teeth are being frequently exposed to stomach acid. For many women, multiple pregnancies really do make it worse, and it is not uncommon to see a sudden increase in cavities during or shortly after pregnancy. Heartburn is the symptom of acid reflux and GERD; however, not everyone with acid reflux has heartburn and not everyone with heartburn has acid reflux. The symptom of heartburn can also be caused by other unusual things such as intestinal motility problems. Cardiac problems can also mimic heartburn and you should not confuse the two. Unexplained chest pain should be evaluated by an exercise stress test or EKG prior to an evaluation for gastrointestinal problems. Many people have different acid reflux-related heartburn triggers, but most people have similar heartburn symptoms. Heartburn may cause chronic cough, sore throat, or chronic hoarseness. Reporting these symptoms is usually all that is needed for your doctor to make the diagnosis of heartburn. However, your doctor may perform special tests to determine the severity of your problem or to monitor your treatment. Special tests may also be needed if you have unusual symptoms such as weight loss or suffer from the complications of GERD. The good news is that there are products that can help reverse the damage done by sodas, sports drinks, and stomach acid. Talk to your doctor if you frequently have an upset stomach or heartburn, to see what s/he can do to help.